Terrifying deaths, scary demons, creepy sounds, spooky shadows and heavy breaths. That’s what horror games are all about. But when it comes to Virtual Reality Systems, that makes everything so much realistic, exciting and horrific at the same moment, we selected best virtual reality horror games to review. Virtual reality, is slowly creeping into our lives. In near future, it’s going to become a part of our lives. For entertainment, it’s going to be our escape way into other worlds. Its reality based experience is what makes it addictive. And that’s exactly the reason we have come up with a roundup of Best Horror Games to play in your Virtual reality headsets. A good experience to have in Virtual Reality goggles where you are placed in the middle of a dungeon. Bloody creatures, strange high legged monsters and statues, all will be present there to give you a terrific shock. A daring game it is. Only play if you love to explore the vacant and deadly maze-like place with no idea what the next door holds for you. The sound effects are amazing. It is going to be an experience you have never felt before. Your light and wits will be the only things to save you from the creatures walking down the hallways. A terrifying experience is waiting for you if you play the game by yourself. Check out Virtual Reality Android Games Here! 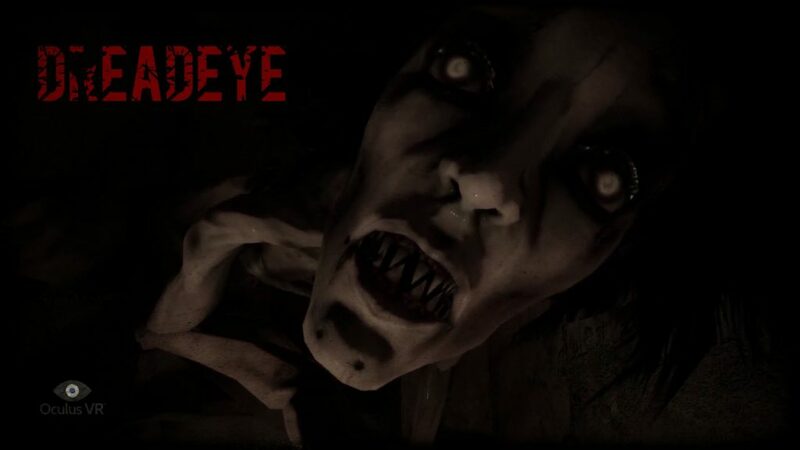 It’s not something that can make you cry or tears of blood will roll out of your eyes but it will definitely give you nightmares in the daylight. In this game, you are in a chair and the horror itself looks out for you. This is the game when you are dumb witted sitting and getting goosebumps by the sounds and creatures coming to you from all directions. Things will be jumping literally to your face and you will not be ready for anything. It is short game filled with A LOT of scary moments. They will cut you out and that is exactly what will scare you. A simple shooting game with a radar, where your mission is to survive from aliens. An extremely immersive and fun game. Intelligent aliens are on the lookout for you. Once they see you, you will be very lucky if you survive. You have to be around the objects to have a sneak peek at the aliens or else they will slaughter you. They will cut your abdomen with their claws and freakishly take it back out, while your camera shakes. All this can be seen exclusively if you tilt your head while wearing Virtual Reality headsets. But this horror game is a definitely yes from our team. Specially designed for Oculus rift with 3D graphics. This game allows you to choose one of the three floors at the menu screen. Once you have selected an options, you will be entered into the floor of your selection. These three floors give you three distinct horrifying experiences with abrupt simulations that can give a sudden shock throughout. It’s a quick game testing your responses. Also, Check out the Best Games for PS4 Camera! It’s more of a game inside a game that will constantly mess up with your mind. It will make you forget about the difference between the reality and the fake world. In this game, you will be sitting on a couch, more of a sofa with the windows on your right and left. You can rotate your head throughout to have a look at the room. You will be so engaged in playing the game on the screen on your front that it will eventually horrify you with the sounds. A dark castle you are in with wind sounds in the background making the whole atmosphere very spooky. The call for help is where you will be getting your path, using your lamp along the way and unlocking the doors. Your virtual reality headsets are going to help you throughout the game to experience out of this world feelings. Graphics, sound effects, background music are all present required to give you an adrenaline rush. What makes crystal rift unique is the modifications you can make in the game. You have the option to set the horror level in the dungeon. It’s like a puzzle like game, involving brisk movements, calculated steps and dangers. You have to solve puzzles along the way to make progress where you will be making enemies in parallel too. This game also gives you the option to design your own dungeons and challenge your friends to play. Making it more fun, horror and entertaining at the same time. These are just a few of the horror virtual reality video games that are now available for the gaming goggles. As the tech giant have jumped into the Virtual Reality production by releasing fine products like Oculus Rift, PlayStation VR, HTC Vive, Samsung Gear VR etc., the advancements in the functionality offered has escalated. However, they are still testing out the limits to bring in the virtual video games and virtual reality headsets and always on the lookout to make things better. It’s just a beginning to make your nightmares come true. With everyone trying to make the best products, we have provided you with the best virtual reality horror games to keep you engaged for a lot of days. What do you think about the virtual reality gaming experience? Let us know in the comments. Check out the interesting applications of Virtual Reality! Thank you so much! Means a lot. We hope, we have added value. Our team will keep updating the website with more and more content. Stay happy and keep inspiring people.